When Harris is not making improbable game-winning shots for his AAU team, he’s playing for South Garland High School in Garland, Texas. The 6-foot-3, 194-pound shooting guard averaged 21.2 points per game while shooting 48 percent from the field and 45 percent from behind the 3-point line a year ago. Entering his senior season, Harris has seen his stock rise and is rated as a 3-star recruit and the 174th-rated player in the country, by 247Sports composite. 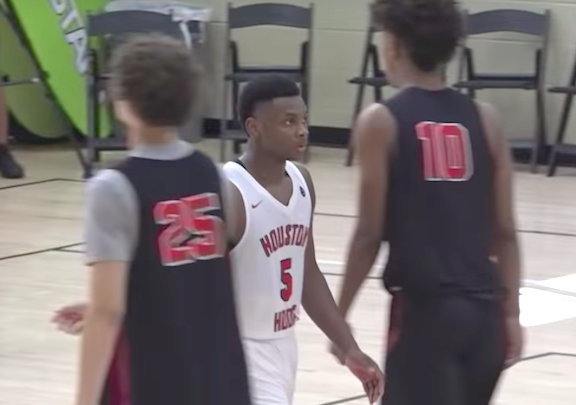 Harris took some time out of his busy AAU schedule to discuss the crazy buzzer-beater, what he’s looking forward to at the next level and who would play him in a movie. Prep Circuit: You scored five points in one second, and everyone talks about the shot you made to win the game, but I was wondering if you thought it was weird that the clock didn’t move at all when you initially got fouled to set up the game-tying free throws? PC: You get the steal after the free throws and then make the game-winning shot while turning in the air. Do you practice shots like that? CH: I practiced it a couple times in practice; I guess it helped since I’ve done it multiple times from multiple different spots and it helped in that game. PC: Was there anything going through your mind after the steal, or did instincts take over? PC: What about at the free-throw line. Any nerves? CH: Calmness. I shoot a lot of free throws. I shoot over 300 free throws a day, so it just came naturally; the crowd didn’t really bother me. Who made the biggest influence on your life? My father. He taught me a lot about basketball, a lot about life, he told me to stay grounded, never get too big-headed 'cause you never know when the ball is going to stop bouncing. PC: You’re a recruit for Texas A&M. What made you decide to commit to the Aggies? CH: Great coaching staff, great facilities, great academics; and they said they would help me with my ultimate goal, which is to play in the NBA, and it’s truly like love down there. They showed me all kinds of love. It’s just a family atmosphere when I went down there. PC: What are you looking forward to most when you start playing for Texas A&M? CH: When I get down there I hope it doesn’t change. I hope the coaches stay faithful to what they said. And just have fun, experience college and hopefully get to a natty (NCAA National Championship game). PC: If you make the NCAA Tournament, we know buzzer-beaters are common there, at least you have experience with that already. CH: Yes sir, if we ever need a buzzer-beater, I hope they know who to get the ball to. PC: I hope you’re a little bit taller than Kevin Hart (5-foot-4). CH: I’m way taller than Kevin Hart. They would have to give Kevin Hart some booster shoes or something. PC: What’s your pregame routine? CH: I usually listen to music, and just vibe to my music, and just sit there and be quiet. PC: What do you listen to? CH: A lot of rap 'cause rap gets me pumped up, gets my adrenaline pumping. PC: What’s your favorite sport besides basketball? CH: Football. Played football when I was young. PC: What position did you play? CH: Quarterback, middle linebacker and safety. PC: What is your favorite thing to practice? CH: I really like practicing on my weaknesses so I can get them as strong as my strengths. It would be like ball-handling, lateral quickness, finishing around the rim and my core. PC: What’s one thing you think you need to improve on before you go to play in college? CH: My body. Get in better shape, get my abs right, get my legs more athletic. If I get my core right, I can be more athletic than I am right now. 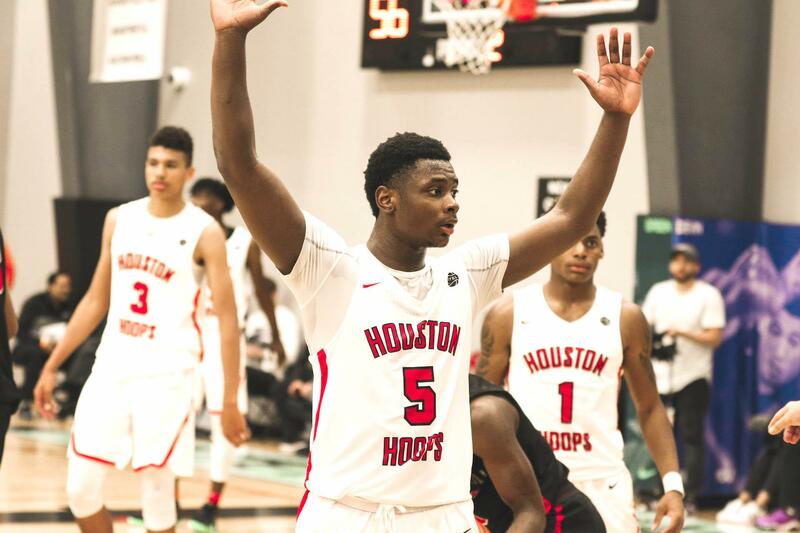 Click to view more photos of Harris and his Houston Hoops teammates. PC: What is your all-time favorite basketball memory? CH: It’s either the shot I made at Peach Jam, or the time I bounced [the ball] and dunked it against Eisenhower [High School, Texas] to go to the fifth round of the playoffs. PC: You actually bounced and dunked in a game? CH: I bounced it on the floor, caught it and dunked it in a game. When I bounced it and dunked it, the buzzer went off, so it was the last play of the game.